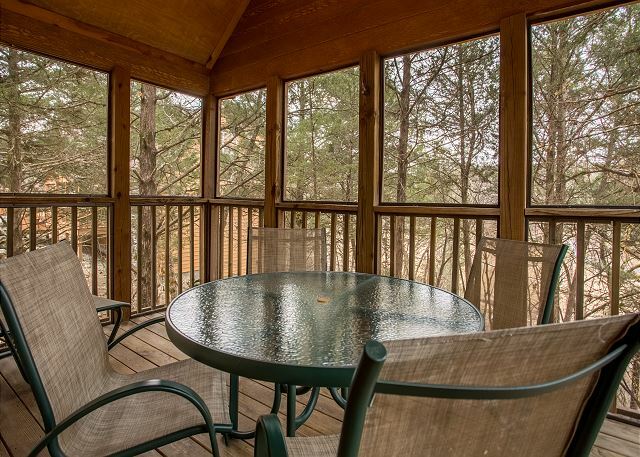 Observe the beauty of the Ozarks in this quaint two bedroom cabin, surrounded by nature and splendor. 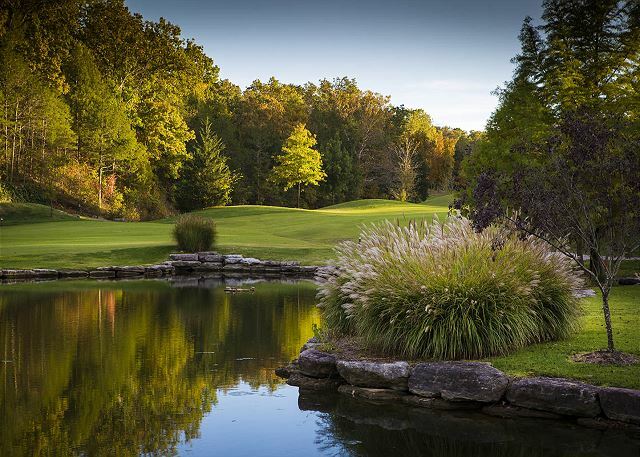 Sit in the screened-in deck and take in the sounds of the babbling creek as you watch the golfers swing on the 9th hole of LedgeStone in the distance. When you get your fill of flora and fauna, take a quick trip to Silver Dollar City, famous for its fun rides and attractions! 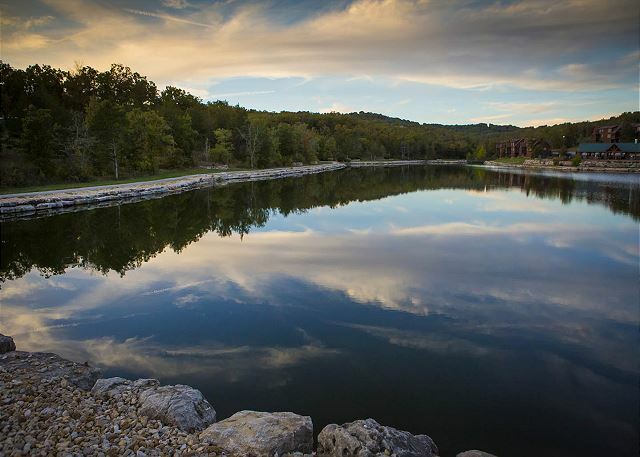 Head south just a little farther to see Tablerock Lake and make a big splash! 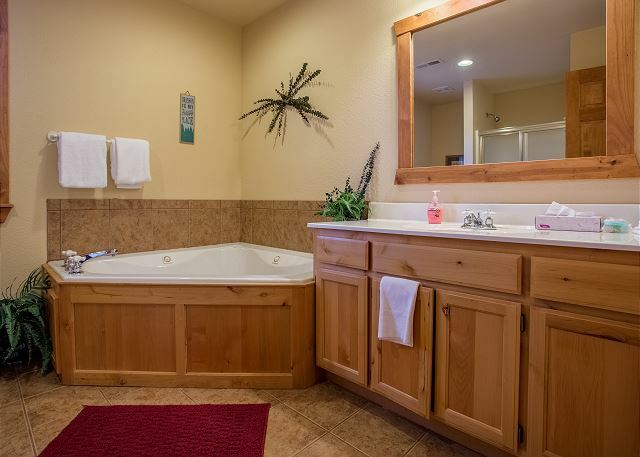 Come back to your private paradise and take a nice, warm bath in the large, jetted tubs found in both bathrooms! Then, show your family back home just how much fun you're having with free wi-fi internet. Make some plans to bring them to Branson to have some family-friendly fun of their own! We loved our Cabin rental. 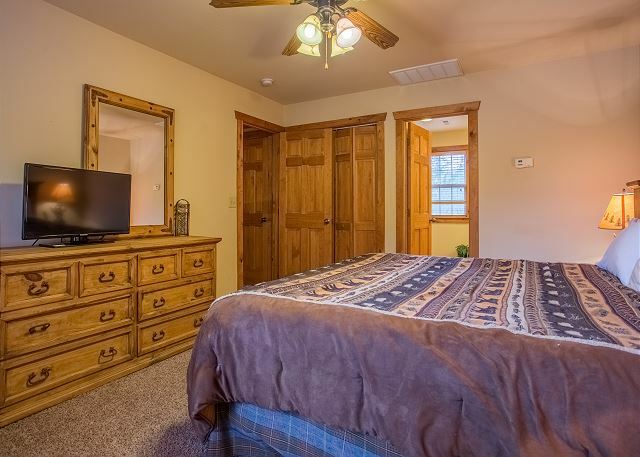 The beds were super comfy, the décor was perfect for a cabin, the location was very quiet and peaceful, and we were really able to relax. Our kids and our two dogs had a wonderful time! We fished at the big pond, hiked around the cabin, and relaxed in the living room. We would definitely stay here again! Thank you so much for the great review, Lidia! We are very happy to hear that you enjoyed your stay with us. 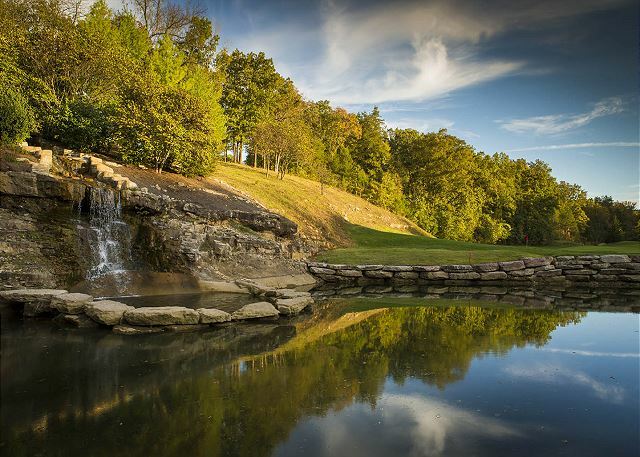 We hope to see you again on your next Branson vacation! Perfect place with 2 master suites. Clean, close to everything! Beautiful surroundings! Loved the gas fireplace - used it every day. We are so glad to hear that you enjoyed your stay, Diane. 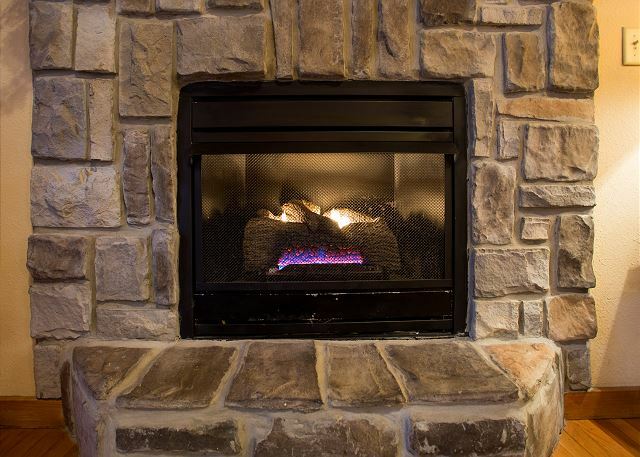 This certainly is the best time of year to take advantage of that fireplace! Stayed 3 nights. Another couple joined us. Very nice accommodations and close to Silver $ City and the strip. The property was very clean. However, I think the cleaning fee is way overpriced. Parking was difficult. Overall it was a very enjoyableand comfortable weekend. Am planning another stay in a bigger lodge for our family. The Mayberry Lodge was a great cabin. It was very clean and had plenty of supplies in it. It was so quiet there I did not want to leave and go back home. I highly recommend this cabin. nice house, comfortable. screened in porch was awesome but could use a fan. decent yard for dogs- but previous renters haven't picked up after them :( beautiful community but only one gate guy was friendly - the others were grouchy and we wished we could have used the closer resident entrance! The cabin was adorable - super homey! We loved our stay here! The resort had a lot of nice amenities too. We would definitely stay here again! We didn't end up bringing the dogs with us, but it's great that, at this cabin, it's an option!! Loved this cabin! Very clean and comfortable. Really enjoyed the screened in porch and two master suites! Pet friendly with great parks, very little grass in the yard. Management was very helpful with all needs! Very nice, clean cabin. Matching master suites up and down so our girls had their own big room to share. Takes a bit of winding to get back into the development, but that also makes it a very quiet and private spot. Had a wonderful time. Cabin was so cozy and nice. Very clean and well equip to cook a traditional holiday meal. We supplied food but all cookware and serving dishes were there. Very pet friendly. No complaints!! The unit is quite nice. Furnishings are great. Just a small suggestion: There could have been more flatware, coffee mugs, bowls, and basic serving pieces. We didn't want to run the dishwasher just for a few pieces of silverware so more would have been nice as we continually washed them by hand. Other than that, it was great! My family and I absolutely loved this cabin. It was perfect for the kids and pets. The fire place was great to kick on at night while lounging around with the family. The Jacuzzi tub was a big plus for the kiddos! It was conveniently located close to everything. We will defiantly be staying here again in the future. Every thing was perfect! 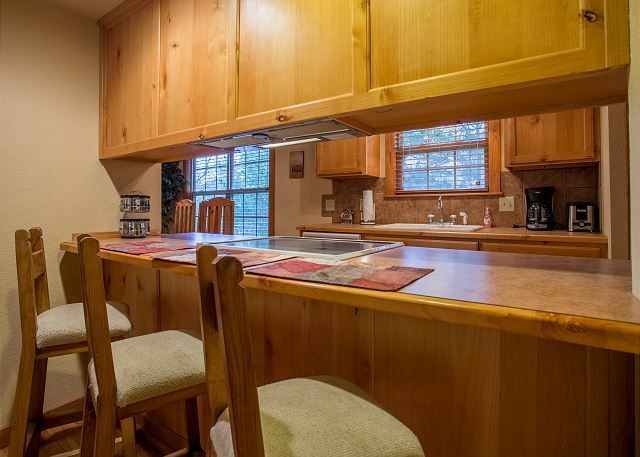 Its beautiful , cozy and cute Lodge, good enough for 6 people. I wish the bedding ( pillow covers and sheets ) were washed. Rest the location and cleanliness was very fine. Overall a good experience. The cabin was great. Like that it is a single unit, not a duplex unit like most in the area. Only downsides were the inability to use the East gate as a renter (reserved for owners only) and the lack of grass area around the cabin for taking our dog out for potty breaks. He was not crazy about doing his business in the dirt and rocks. This location is closer to Branson West than to Branson. We knew this when we rented and did not create a real issue for us. It would have been more convenient to have been able to use the East gate for re-entry to the property, however. Overall it was a great stay and we will consider renting here again in the future. Great place to stay in Branson. Haved stayed here 2 years in a row and plan to keep going back. 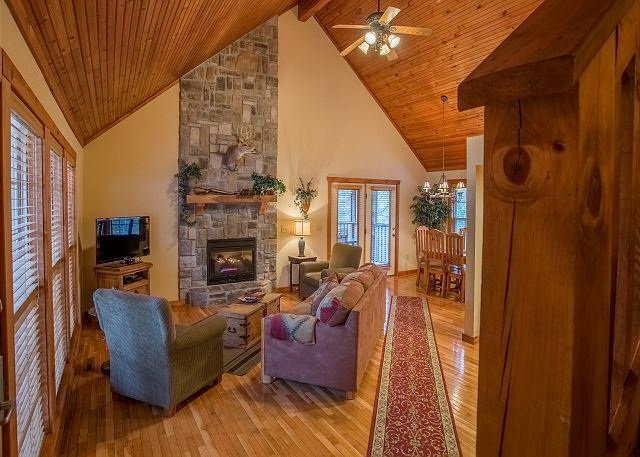 Cabin is perfect and location at Stonebridge is very nice. Good afternoon, Jeff. Thank you for your feedback, we really appreciate it. We're so glad to hear you continue to enjoy your stays here with us. We can't wait to hear from you again! We have stayed at Mayberry Lodge quite a few times. We come twice a year & always have stayed at Mayberry Lodge for the past few years. We first chose it because there are no stairs & that really makes it easier for my husband after suffering from a stroke a few years ago. 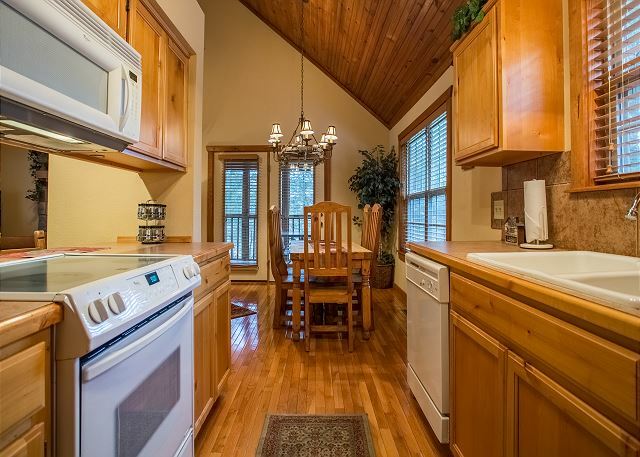 Mayberry Lodge has always been very clean & well equipped & homey. We love it! 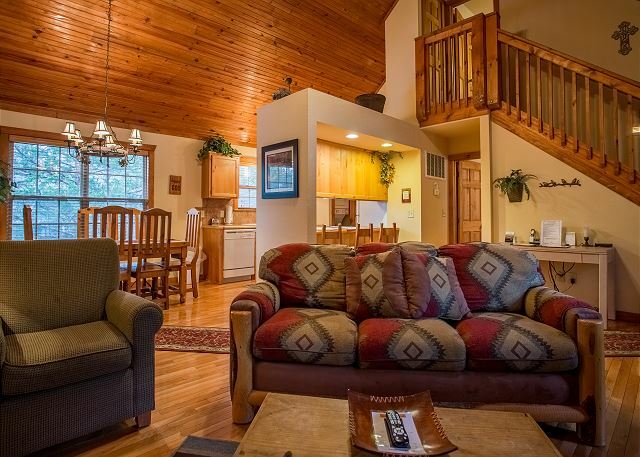 Had a very good experience, location and cabin were very nice and clean. Everyone we talked to was professional and courteous. Would rent from Tom again. We had a great experience staying in the cabin. So comfortable and close to Branson shows. Very clean and everything worked. Screened in porch area was clean and nice.The only thing missing was a grill but who wants to cook on vacation.We will stay again for sure. Great location and really nice property. I was a little disappointed there was only 1 towel per guest for a 4 day stay but there was a washer and dryer on site. Overall it was a good experience and so close to everything. We loved the location and cabin. It was clean and cozy, just what we expected and more. Will rent again. A Satisfied Stay Every Time! We have stayed at Mayberry Lodge around 4 times& are very pleased with each visit. We've neverexperienced any issues there & have always found it very clean & fully equipped for our stay. We will continue to stay here & highlyrecommend it. We had a great time staying in the Mayberry Lodge. Very clean. Had everything we needed. Exactly as advertised. Might be time to replace coffee pot though. It is extremely slow. A Guest from Perryville, Mo. Very nice vacation, there were 5 of us, and the cabin we stayed in was very spacious. We have a small dog that travels with us and we were able to bring him along. Highly recommend. Great place to stay. 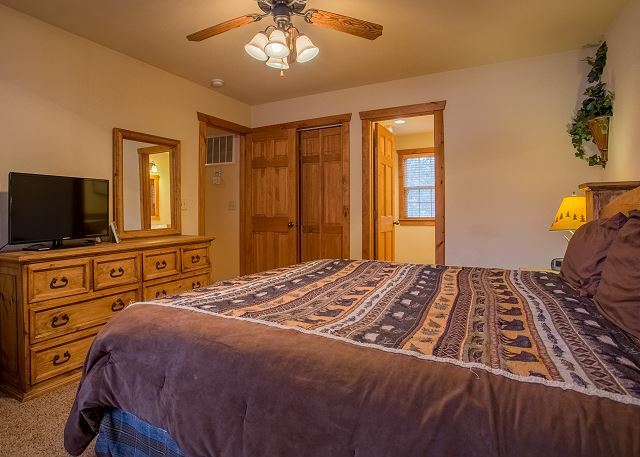 Both bedrooms are masters, 1 upstairs 1 on main level. We enjoyed our time at this nice cabin in Stonebridge. It is on a quiet street and even though there are several other cabins around you it is very private. Very wooded. 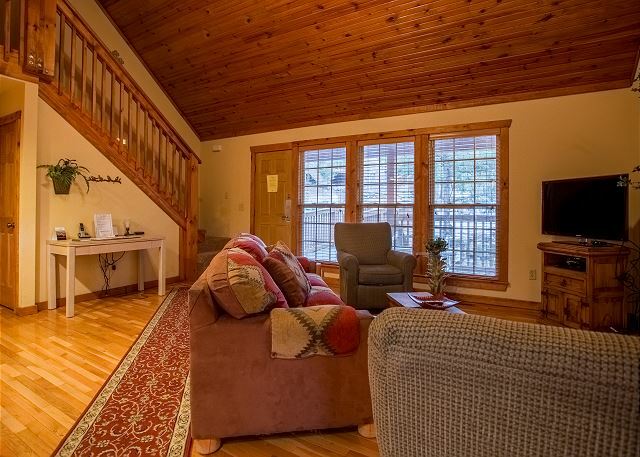 Short two night stay in Stonebridge. Outstanding two bedroom cabin. 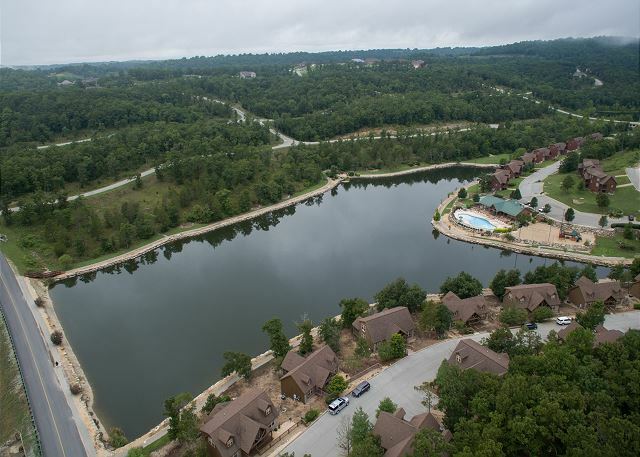 Gated community, a short distance from Silver Dollar City. A/C, WiFi and all amenities provided. Cabin was exceptionally clean! 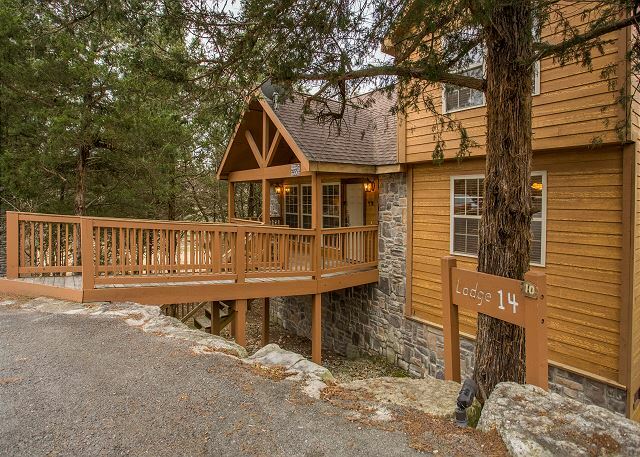 This was our favorite accommodation so far in both Stonebridge and the Branson area. 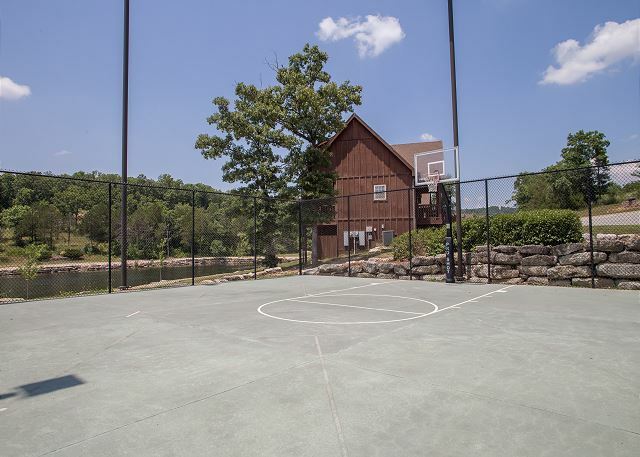 Mayberry Cabin for family vacation. The only real complaint I have were the beds were NOT COMFORTABLE at all. We also used the pullout couch for our 14 yr old and it was in very BAD shape too. Beds need to be REPLACED SOON! Hi Donnie! Thanks for the review! The owner has replaced both mattresses and replaced the decking on the sleeper sofa so it is in much better condition. 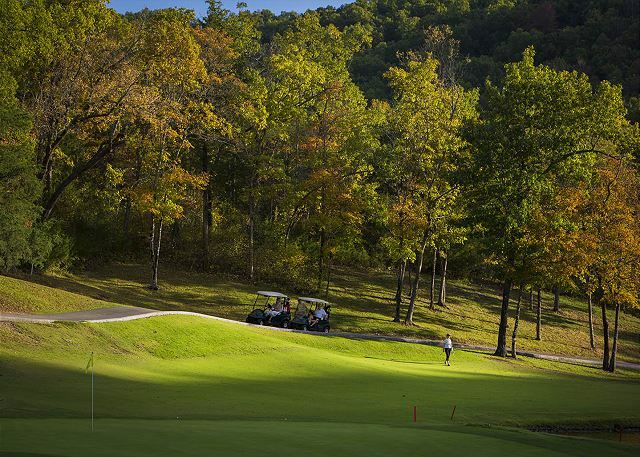 Next time you are in Branson give us a call! The lodge at Roarke Creek was clean and roomy. We love staying at Stonebridge. 4th time staying at Stonebridge Village - best little cabin yet - cleanest, easy walk-in, peaceful, well stocked/supplied. 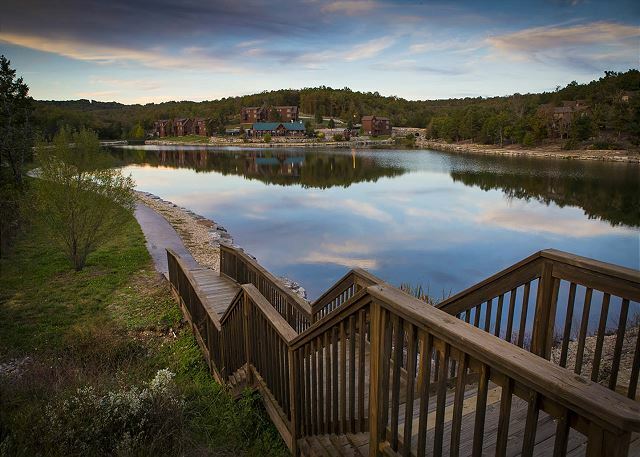 We always look forward to our stay at MayberryLodge when we visit Branson. Our 2 granddaughters (4 yrs. & 7yrs. )love it there &do not want to leave. It is very well appointed & clean. The only 2 things I would recommend would be to put up a wall hook in thedownstairs bathroom & the bed in that connecting bedroom needs replacing. We definitely will book this facility again & highly recommend it. Hi Carol! Thanks for the review! The owner has replaced both beds in the cabin so next time you come they will be very comfortable! Our cabin was very nice. Our dog Lilly enjoyed her stay too. Thanks to all who made our stay comfortable and enjoyable. We were so pleased with Mayberry Lodge. It wasvery comfortable & homey. We will definitelystay here again. It is a very nice place. Although, I did not have a pet; I do like staying at places that allow people to bring their pets with them. It is more family inclusive.Both of the bedrooms were of nice size with king size beds with their own bathroom on-suite. A pleasant surprise. I didn't like the additional charges attached to the billing for property damage and housekeeping services. I talked to the company. They said this was as insurance to protect the homeowner and they contract out the housekeeping services. I think this should already be included in the advertised nightly rate. was one of the best mini vacations we have ever taken. The Mayberry was outstanding, with beautiful scenery. 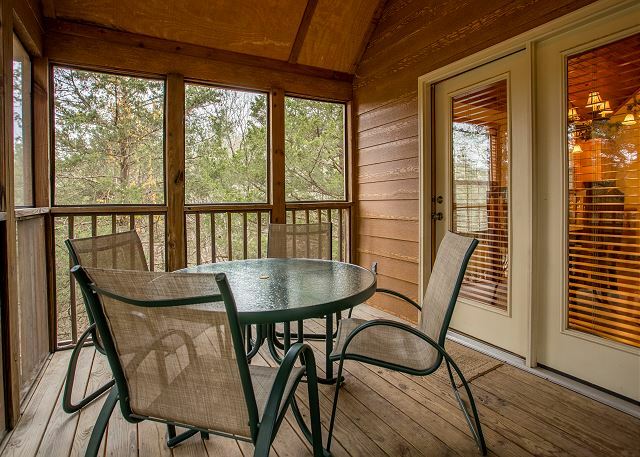 The cabin is very nice, the screened in porch very nice. So greatly appreciated that we could take our little dog along on our trip. Will stay again next time we visit. The description of the property on website is accurate. I would recommend this cabin, very clean and well maintained. We needed a place that accepted our two small poodles for a quick trip to Branson with grown son. 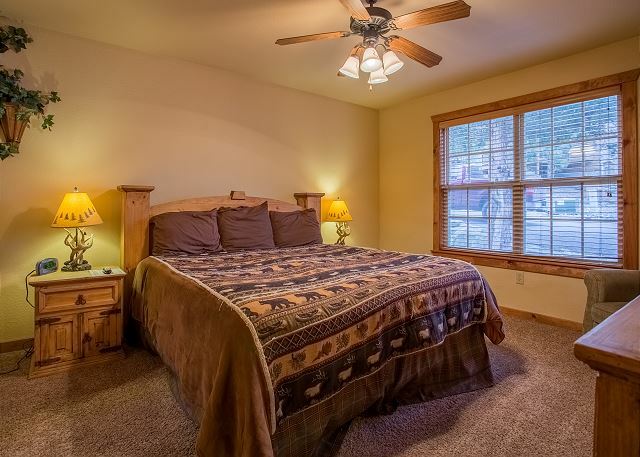 The two master suites suited our needs perfectly. The screened porch was a nice place to hang out,it was something like being in a tree house,you didn't see anything but trees. The kitchen was much better equipped than I had anticipated,but you might want to bring your own paper goods,baggies,foil,plastic wrap,extra shampoo,hand and bath soaps,laundry and dishwasher soap. Coffee pot does not shut off automatically and fridge gets puddles of water all over the food, but we managed those things okay.The drive to and from Branson is a bit long and boring,and renters are not allowed to use the more convenient entrance to get into resort. We drove to Branson every day, saw Clay Cooper show, Spirit of The Dance and The Texas Tenors, shopped, and drove a lot. Loved the food at Danna's Bar-b-q, not far from cabin. 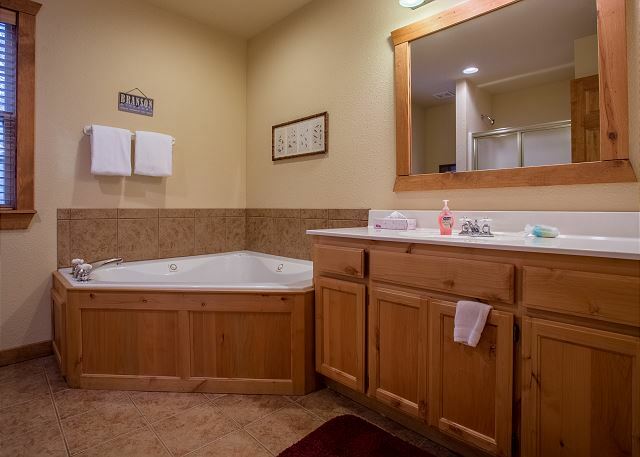 Mayberry Lodge is a comfortable place to stay, especially if you have other adults with you and want some privacy. 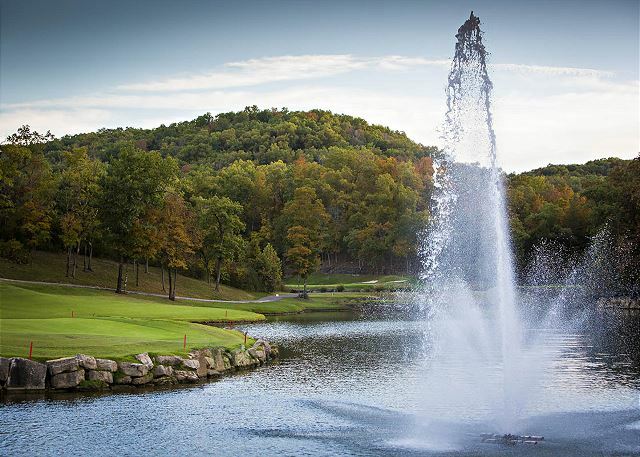 Stonebridge Resort is nice, but it is a fairly long drive back and forth to Branson. 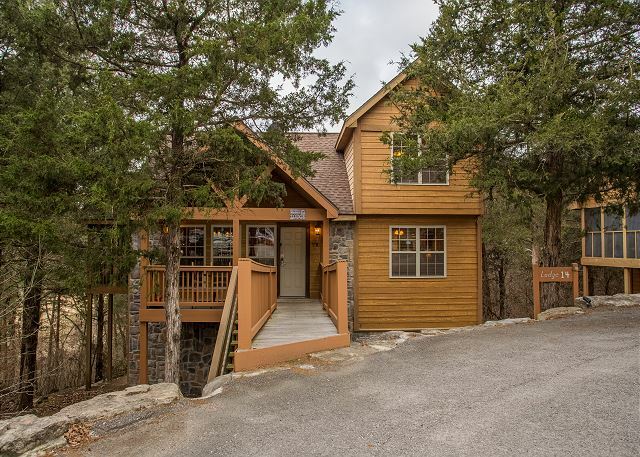 It would be well suited to guests who want to hang out at cabin or go to Silver Dollar City. 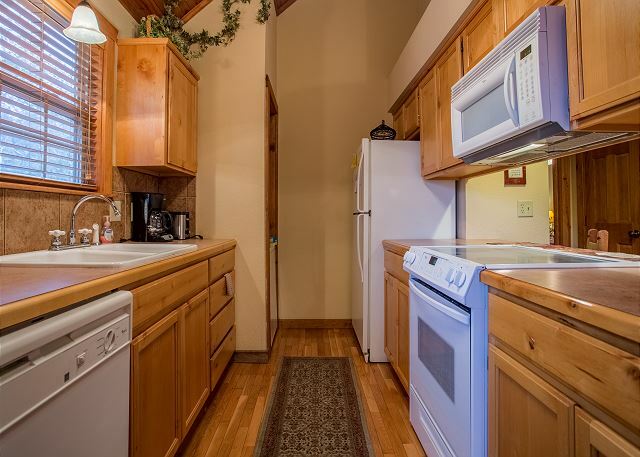 I was impressed that the kitchen was well enough equipped that everything I needed to prepare our meals was supplied. And we loved the gas fireplace! I personally could do without the deer head-lots of other decor more pleasant than a dead deer! Overall we enjoyed our stay very much! Thank you for having us! 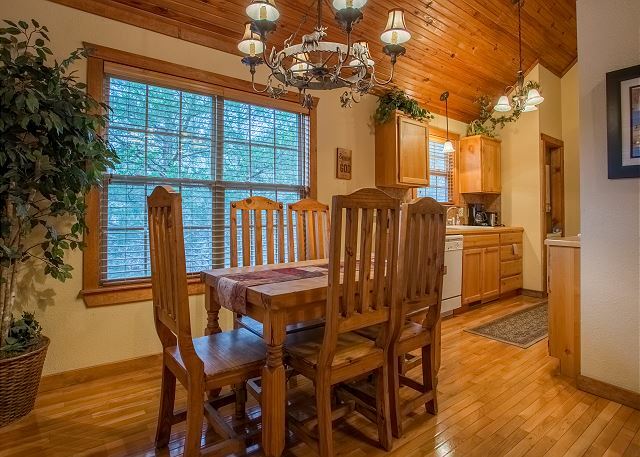 This cabin was a wonderful vacation home for our family of 5. We loved the fact that we had 2 master suites. The cabin itself was very nice, clean and well stocked with many things I wasn't expecting. We loved sitting outside in the screened in porch area. The amenities of the resort were enjoyable also. We will likely return and rent here again in the future! Thank you for this lovely get-away cabin. It truly let us live out Psalm 46:10--"Be Still, and know that I am God." We really appreciate all the amenities and the beautiful setting and were thankful to have a place that allowed us to have our dogs with us. Would continue to encourage the owners to consider getting a new coffee pot as the one available was not functioning very well. Overall,two thumbs and two paws up!! Thank you so much for the wonderful review! We have replaced the coffee pot. 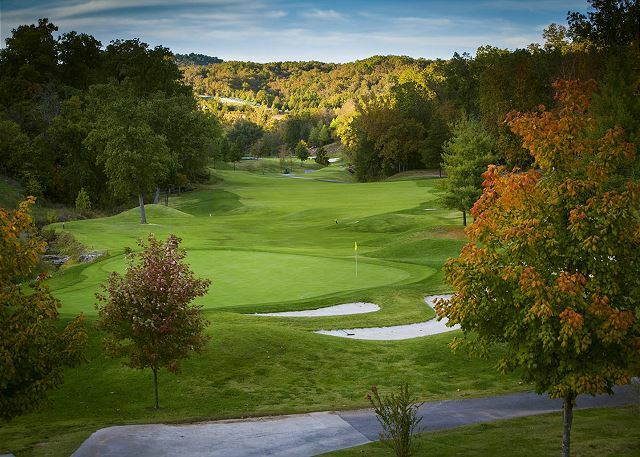 If you return to the area make sure to mention you are a repeat guest to receive a discount! Loved staying at this cabin/lodge. It was so quiet and peaceful. Loved the screened in porch. It seemed like we were in a tree house. Could hear the creek, especially after the rain. Close to all Branson has to offer, but far enough away to not be in all the congestion. Plan to come back again. I loved this lodge! It was great to be able to bring my dog and kids. It rained most of the weekend and we still had a great time. The board games in the closet were a life saver. We absolutely loved staying at Mayberry Lodge! Everything was immaculately cleaned and very nicely decorated. The cabin was nicely stocked. The view was out of this world! If I could change anything, it would be that it is a bummer not being able to use the Owner Entrance just down the road from Silver Dollar City. We will definitely stay here again!! WOW, what a wonderful stay we had! We were greeted by the sign on the wall that quoted Psalm 46:10--Be still, and know that I am God. We knew we were in the right place to get some much needed rest! 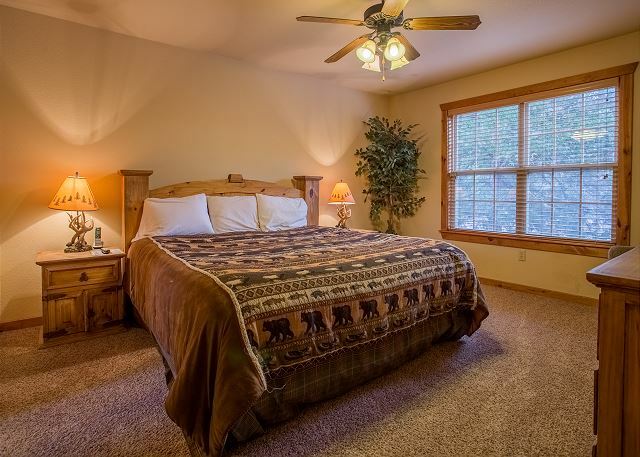 Very comfortable and homey and perfect for staying with our dogs. We will definitely be back SOON!!! Very good stay overall. Even better than expected. 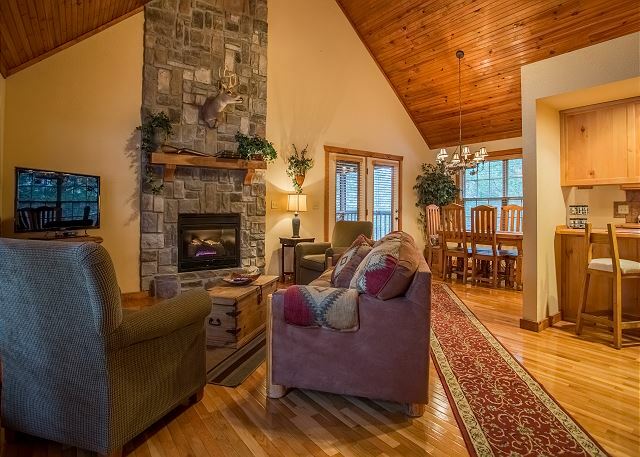 This lodge was especially nice for a winter vacation. 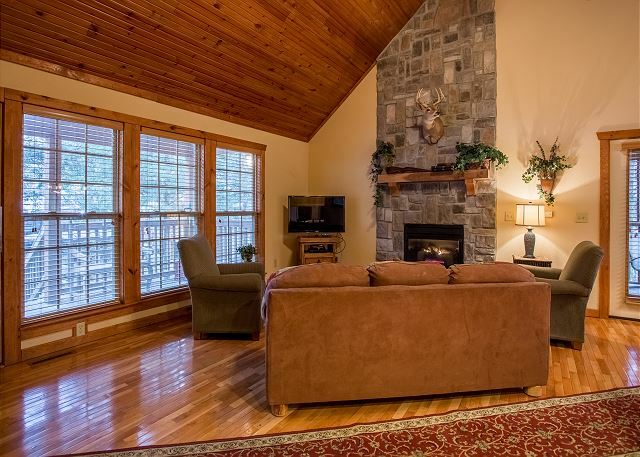 The setting was perfect, and the lodge was cozy with that rustic feel. We enjoyed our 3rd stay at Stonebridge Resort. We will go there again. Overall it was great , the place was nice clean and very spacious, love the outside deck, and is close to attractions and stores . I loved it.